I had the pleasure of living in Richland Center, Wisconsin during my high school years. So I took the opportunity to stop over for a couple of nights at the nearby Rembrandt and Rutabagas BnB while on a trip from Detroit, where I now live, to Minnesota. 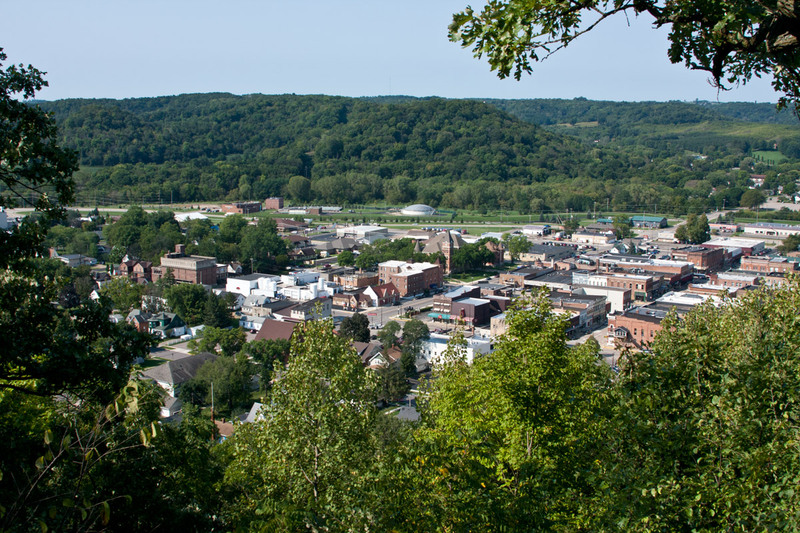 My first activity was to climb the 'town bluff' to enjoy the grand view of the city nestled in the Pine River Valley in the heart of the Wisconsin "Mountains". As the eye travels down an exotic, seemingly out-of-place building stands out. It's Mayan temple-like appearance might make one wonder if was dropped there by extraterrestrials. 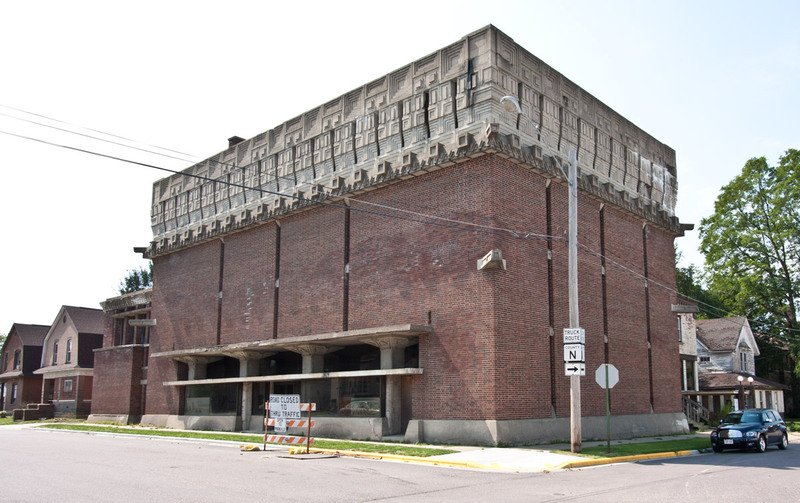 But we all know it as the AD German Warehouse designed by Richland Center's most famous native son Frank Lloyd Wright. He would go on to arguably become the greatest architect of his time. 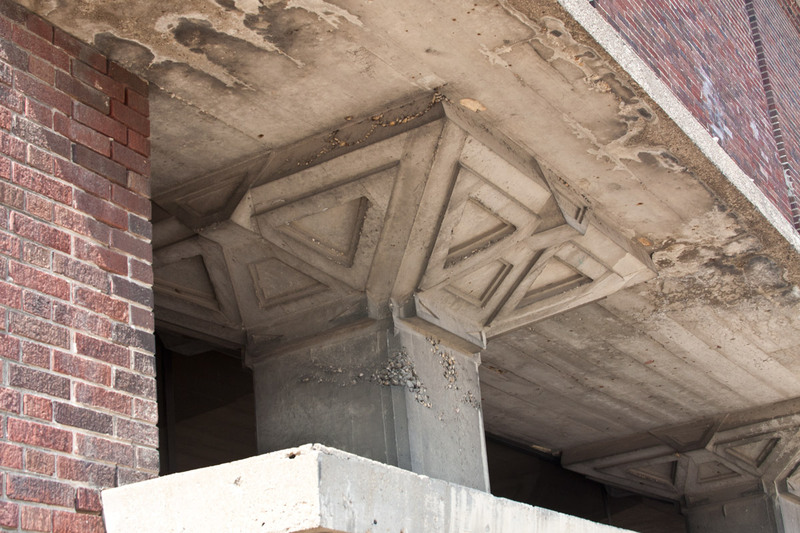 Built between 1917 and 1921 the massive fortress-like structure is topped by a commanding cast concrete frieze which elevates the structure beyond a common commercial building into a stunning sculptural totality. When I last visited Richland Center, some 20 years ago, the warehouse had been converted into a museum. Imagine my disappointment to find the doors locked. Only the remains of faded and dusty displays could be seen through unwashed windows. Deterioration of the its unique architectural appointments had set in and building presented a blighted and decaying face. Yet its magnificence is undimished. How could this happen? It was the same in-disbelief question I had pondered about the many beautiful and historic abandoned structures of Detroit when I undertook my 1997 web story "The Fabulous Ruins of Detroit". Richland Center and Detroit, I thought, so far away and yet so close. And now ¨with its own fabulous ruin. 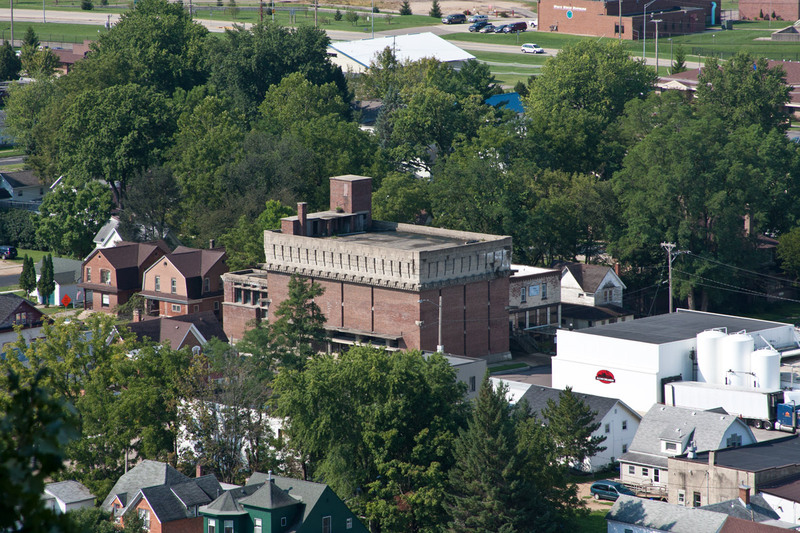 Richland Center is the county seat of Richland County. 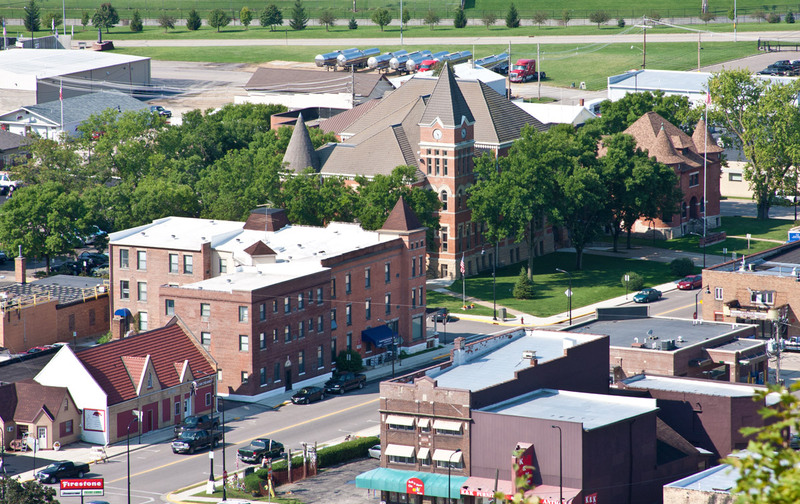 Its courthouse, jail [above center and right] and the former Park Hotel [to their left] were built in the 19th Century, as was much of the downtown. 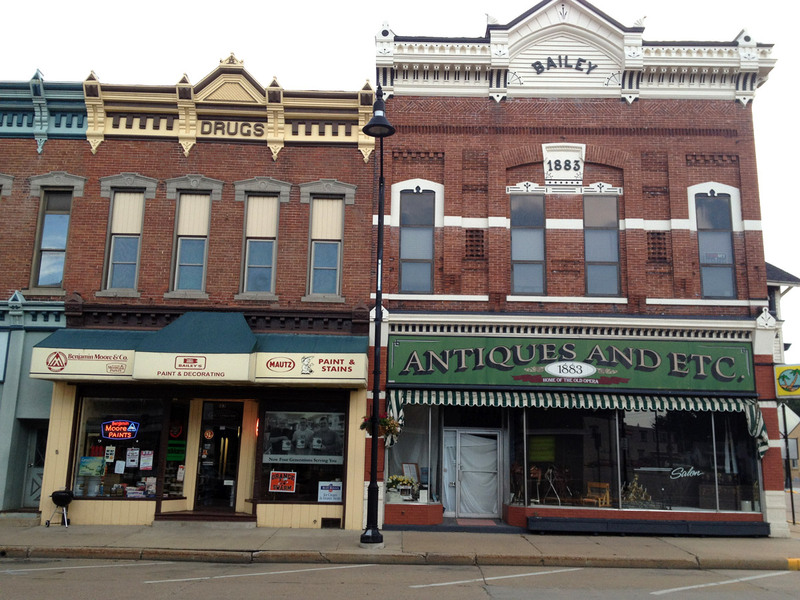 The downtown has some excellent gilded age commercial structures and still many thriving businesses. Like downtown Detroit, there also are several vacant and dreary store fronts in the old downtown. Once bustling streets are quiet and thinly parked. Some of the remaining businesses have a "last legs" marginal appearance. Like Detroit and many older city centers, large and small across America, the historical and architecturally significant downtowns have been devastated by new characterless shopping centers built on the fringes of the old cities. Their ease of parking and corporate chain-stores with discount prices have competitively destroyed the old centers. 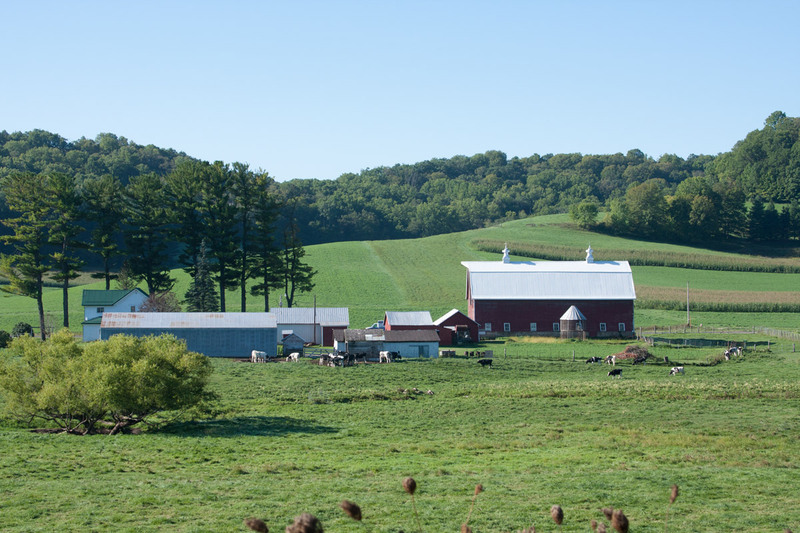 Today, when one arrives in Richland Center from the south, a mile long commercial belt sprawls out from the city's edge. It includes a giant Walmart, followed by a large strip mall. It is a microcosm of the Detroit story. The population of Richland Center is just over 5000, the same as it was when I lived there 50 years ago. The county has less people than it did in 1900. The properties are generally well kept as exemplified by this turreted sandstone beauty. The streets are pleasant and the house I lived in is in excellent condition with the same old burr oak tree in front. 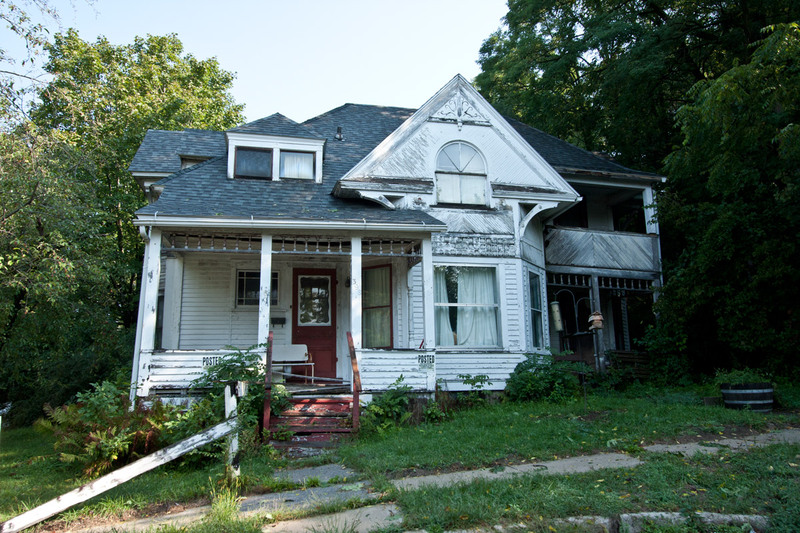 Yet like Detroit, one encounters abandoned properties like the lovely crafted wood house. The core economy of this region has been the diary industry. It's long decline, which had set in during the years I lived there, helps explain some the stagnation of population growth, Richland Center and the county. Like Detroit, when its core automotive industry faltered, it finds it necessary to reinvent itself. 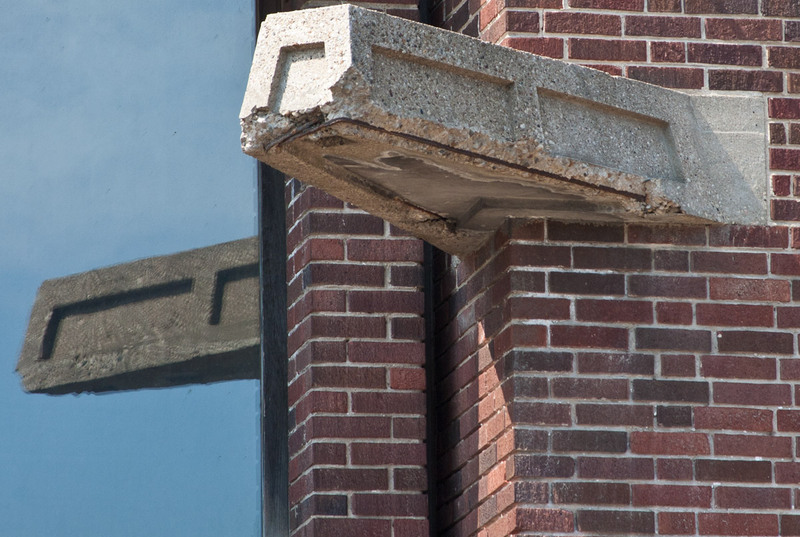 Progress appears to have been halting like Detroit's, steps forward, steps backward. Some manufacturing enterprises have arrived. A gleaming new high school and 2 year college provide a solid educational basis. The once threatening waters of the Pine River are now held by back by new dykes. 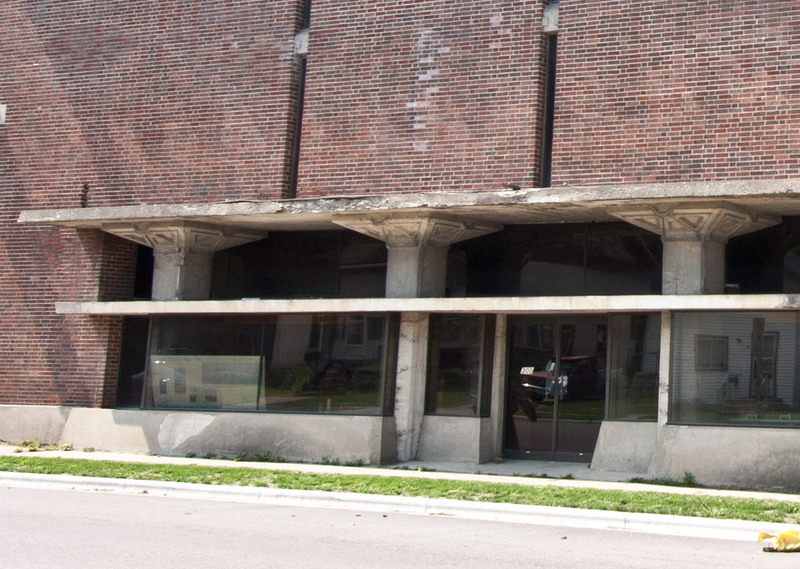 Unfortunately there has not been enough progress to save Richland Center's fabulous architectural artwork from falling into ruin. Thankfully there are those working hard to preserve German Warehouse. Asking price is a mere $160,000 but restoration costs obviously far more ['mere' considering what it would fetch in Chicago if it were there]. A recent city council vote to acquire the property required 6 supporting votes of the 8 members. It fell short by just one vote, losing 5-3. It has been cast back in to limbo and again faces an uncertain future. Richland Center would benefit greatly from acquiring it. With a minimal investment to seal the property and prevent further damage enough time could be bought to acquire funding, determine its future re-purposing and prevent its loss. 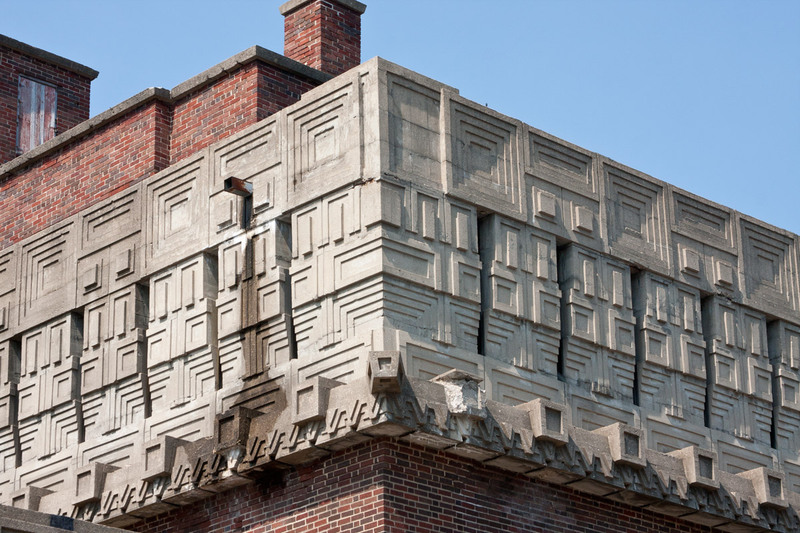 There are many preservation funding opportunities for a project like this. Such an effort could be leveraged by branding Richland Center as the birthplace of Frank Lloyd Wright centered around this magnificent masterpiece - an enticing attraction that drew me and my dollars back to Richland Center as much as did the memories and natural beauty of the area. To the Richland Center family, chance has blessed you with this spectacular one-of-a-kind work or art. No other city around you has anything even remotely comparable. Even better, it is a work of one of your own, a kid from Richland Center who became a world famous architect of gigantic proportions. There is a saying, "Great architecture has only two natural enemies: water and stupid men." I trust that won't get stuck on Richland Center. You are bright and civic-minded people as I know from living there and can see in the construction of your new high school and college, the lovely restoration of your train station, the careful maintenance of your historic courthouse and jail and the vast improvements to Krouskop Park. You are more than capable of preserving (and gaining the benefits from) this great gift. You will earn the eternal gratitude of your future generations. 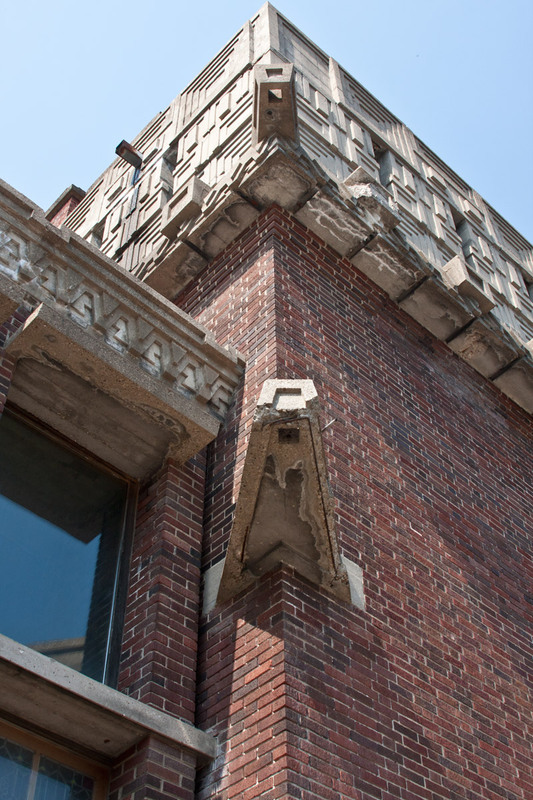 We have had many preservation successes in Detroit, but have also had some great losses. Our world famous Orchestra Hall had fallen to being an rotting ruin that was minutes from the wrecking ball. Today is it the resplendent home of the Detroit Symphony Orchestra. It has spawned development on all sides of it that generates millions in revenue for the local economy. Detroit still has many opportunities to make things right. Richland Center gets only one. 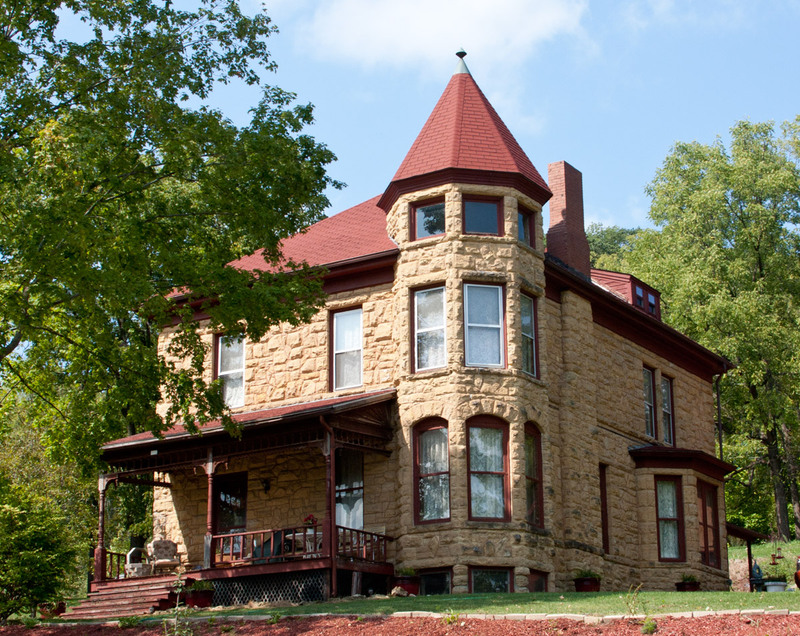 *Rembrandt and Rutabagas BnB is a sensation Bed and Breakfast lodging nestled in a classic farm valley. Jane Kintz, artist and owner, has built this modernist beauty by expanding out from the farmhome where she was raised. Its airy art-filled interior features open spaces and dramatic vistas of the serene beauty that surrounds the house. The breakfasts are to die for. 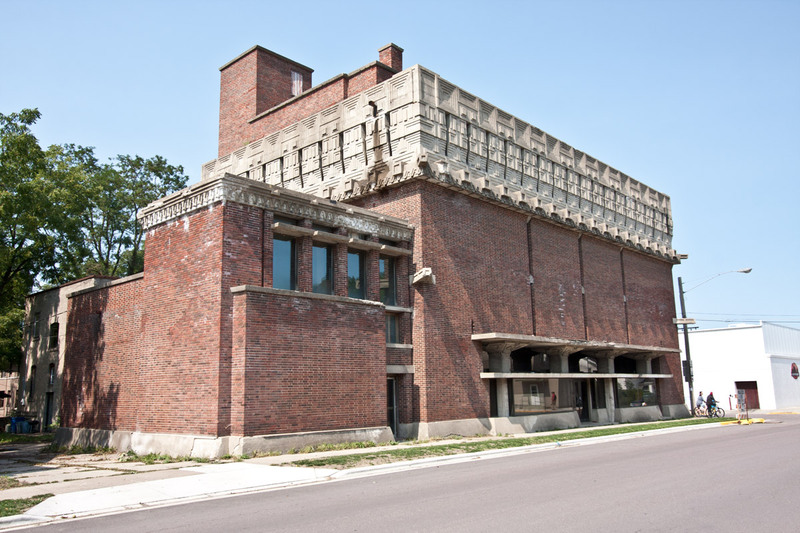 Jane has also been an activist for the preservation of Richland Center's architetural wonder, Frank Lloyd Wright's AD German Warehouse.